Let me tell you the story of a mine. Not a gold or coal mine but the Mokau mine a fiendish explosive device laid by the Germans in 1942 and washed ashore when it broke it moorings. 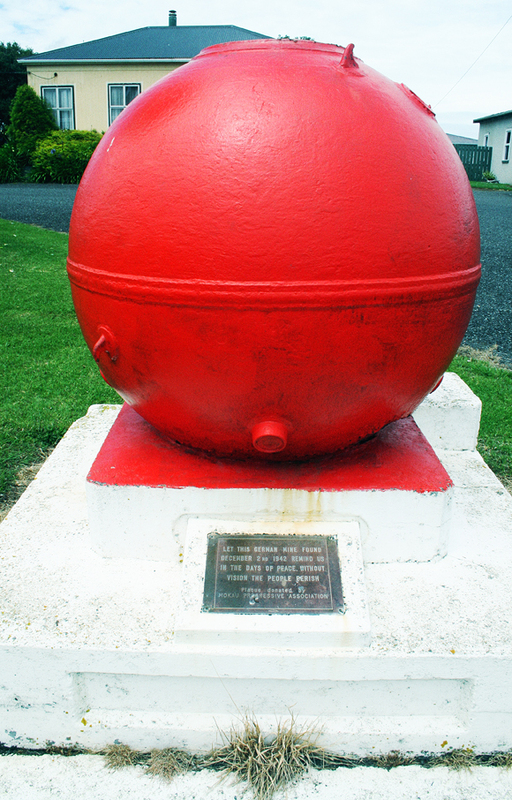 I remember it well as the good townspeople of Mokau, a small town in northern Taranaki, erected the device on a concrete plinth in the centre of town. It sat adjacent to the Mokau General Store and sits there still although the store is now a mere peeling shadow of its former self. In 1960 when I was a pupil at Waitara Intermediate my best friend was Rodney Warman whose parents owned and operated the Mokau General Store. He invited me back for a holiday at his parents place. There are things that stick in my mind; one was the smell of dog as Rodney’s parents had a house full. The second was whitebait for which is Mokau’s main claim to fame. The small delicacy makes it way up the rivers at certain times of the year in large shoals. In the times that I write about these shoals were huge – enough to fill a large kerosene tin with one scoop of a net. Whitebaiting was a main source of income for many and Rodney’s father took us up river to spend a morning chasing the ‘bait. We travelled across by boat to the place where he had a set net, just in time to catch the incoming tide. I have never eaten so many whitebait, before or since. We got literally buckets full of them and a sizeable sample was put aside for our domestic use, to be turned into the Kiwi classic – whitebait fritters. 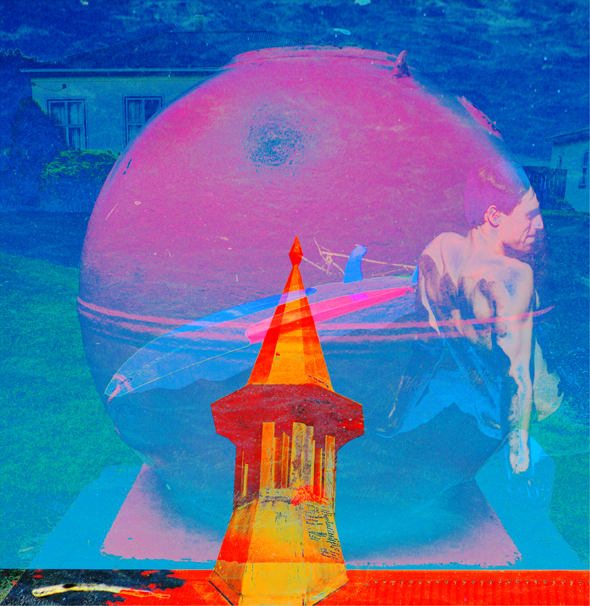 The final memory of have of Mokau was go to the ‘pictures’ ion the town’s hall. In those days it was still obligatory to stand for the Queen - when here national anthem was played. Those who dared to buck this tradition got a short, sharp jab in the ribs from the patrons behind, forcing them to stand to attention. The movie ambiance where no the sort I was used to at Waitara’s Theatre Royal, run by a Mr Pizzey. His theatre had a plush curtain, lighting effects and muted sounds that played before the curtain silently opened and the lights were dimmed. In Mokau the make-shift theatre could best be described as Spartan with hard forms for seats and a cracked slide of the Queen when the anthem was played. For all that we enjoyed the outing tremendously. So it was a pleasure today to see that the Mokau mine was still in situ. The cafes are still selling whitebait but I very much suspect the days of the ‘big runs’ are long gone. My goodness what are they trying to do? Kill the population? 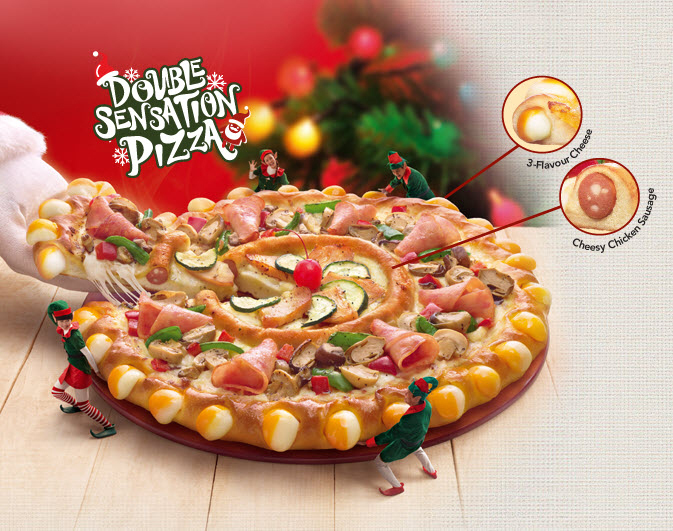 A pizza within a pizza has go to be the most insane and calorie-laden piece of food around. No wonder the Singapore fertility rate is dropping! The body must be far to busy trying to deal with the fat intake from a meal like this. They should be calling it "Double By-pass" not "Double Sensation". 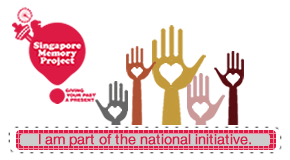 If you have demolished the last of your mints and failed to achieve a 'mint moment' you may have to turn to the latest initiative from the Social Development Network, the agency that is doing its very best to push up the marriage and birth rate in Singapore. Apparently one can now buy a 'love voucher' to give a 'love gift' to a partner of choice and there is even a web site set up to do so. These are not the kind of 'love gifts' that would have enough value to buy a Dior handbag but ten bucks goes a long way nowadays. To be more precise these are 'Love Gift Dating Vouchers' and you can only redeem them with an accredited dating agency. So if you have a sweet tooth and a box of chocolates was on your mind, forget it. Its professional services and activities only; dancing and adventure tours included. And you need to be somewhat of a speed-dater and make up your mind, as the vouchers run out in 4 months and are non refundable. You have to give the SDN an 'A' for effort - at least they are trying to boost Singapore's low fertility rate and have been doing so since 1984. And the Love Vouchers are being followed later this month by the Dating Fest where singles will qualify for a 50% subsidy to "offset the cost of activities and events organised by SDN Trust-accredited agencies". At end of the event, they hope to gather 500 singles and break the local record for the most number of singles participating in a speed-dating activity. Think I'll stick to the mints - it all sounds bit too frenetic to me. Never lose your way again with this iPhone 5 Case. 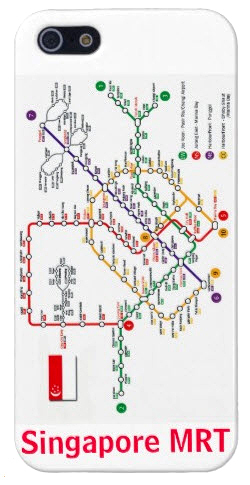 Seems a good idea to be able to quickly reference the MRT map without going online. Loan the case to your visitors while they stay with you; just make sure you get it back! Protect your iPhone 5 with a customizable iPhone 5 case. Made of lightweight hard shell plastic, this case protects the back and sides of your iPhone 5 without adding bulk. Want to see other iPhone case designs? 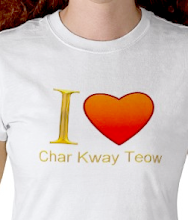 Have a look in this online store. I am delighted to see that the urban planners of Singapore are going to the trouble of linking together the heritage sites, museums and walkways, as explained in the video above. As one who regularly enjoyed these places I remember only too well trying to hug whatever shade was available when strolling in the tropical sun. For the most part the signage to these buildings and heritage sites is very good. However there are some parts that are not shown so well on the map and unless you are a 'local' are difficult to navigate - the shortest route between two points of interest in such a climate is usually the best. Imagine how unpleasant it must have been to work on the Singapore River in times gone by. This photo from the reign of George VI shows how congested it used to be. No urban walkways and very few green spaces. 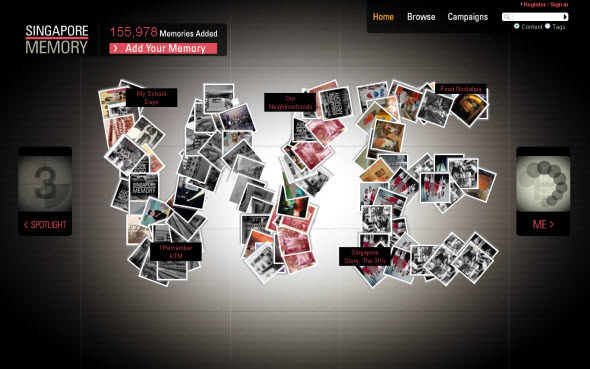 I was delighted to receive an invitation to participate in the Singapore Memory Project and to pledge this Blog to the cause. Harnessing the collective memory is an excellent initiative and the National Library deserves full credit for getting it under way. I am only too aware that those who can contribute the most to are often the ones that feel the less motivated to do so. According to their site the project is a national initiative started in 2011 to collect, preserve and provide access to Singapore’s collective knowledge base. In other words telling the Singapore Story through the eyes of its citizens and those fortunate enough to live and work there. "It aims to build a national collection of content in diverse formats (including print, audio and video), to preserve them in digital form, and make them available for discovery and research. The SMP aims to collect 5 million personal memories as well as a substantial number of published materials on Singapore by 2015." I hope that all Singaporeans will support this project. Once memories pass with the generations they are gone for good; they need to be captured before this happens. This video has gone viral - the Singlish Minister addressing China Bus Drivers' Strike in Singapore. The 'lead man' a great little actor. The thought of striking bus workers is enough to send shivers down the spines of older Singaporeans, many of whom have memories of the Hock Lee bus riots of May 12, 1955. The Communists had organised a series of regular strikes and disputes and on that occasion four people were killed and 31 injured in a bloody riot. Little wonder then that the government has come down hard on Chinese bus workers who have recently staged an illegal strike. 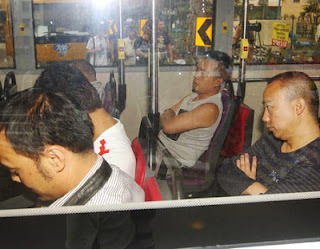 They have just announced that they will deport 29 of the mainland Chinese bus drivers and prosecute five who were apparently the instigators. 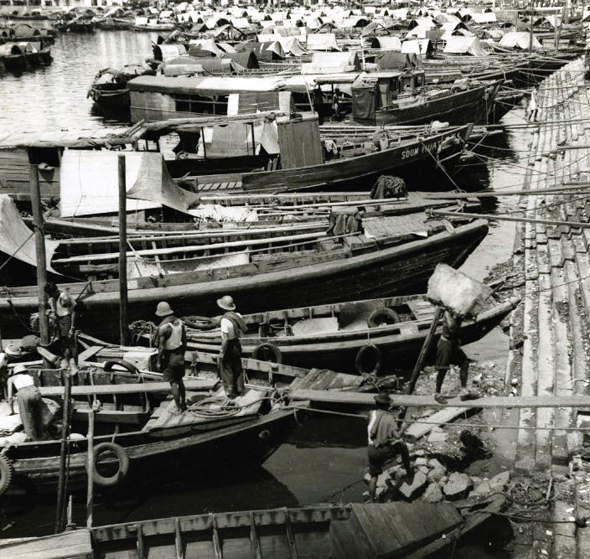 Singapore's last strike occurred in a shipyard in 1986 and the powers that be have no desire to see it repeated, even though there is some popular sympathy for the conditions in which the Chinese drivers lived and worked. But the country did not appreciate the way they went about sharing their grievances. Nor will they tolerate any further disruptions to public transport on which so many of them rely. 44% of bus drivers in Singapore are from either Malaysia or China; about 22% from each country. So 275 of mainland Chinese drivers did not strike while 175 chose to. "The actions of these SMRT bus drivers disrupted an essential service and Singapore's industrial harmony. While the SMRT bus drivers may have had grievances, these should have been raised through the legal and proper means available. 5 persons will face charges in court for the offences committed, and will be dealt with in accordance with the law. 29 persons who were blatant and persistent in their unlawful acts have had their Work Permits revoked and will be repatriated. Those who returned to work upon realising that this action was illegal will be issued warnings by the Police." So the industrial harmony on which so much of Singapore's prosperity depends has been restored and the economic bus can resume its forward momentum. In the words of the immortal duo Flanders and Swan in their Transport of Delight song "Hold very tight please, ting ting".